I finished up the knitting and wove in the last half (from 50+) of the ends just in time to throw the whole thing in the washer on the morning of Christmas Eve. Have I kept you in suspense long enough yet? Here’s a picture of the final project before I felted it. I probably could have put this Backgammon game board through another round in the wash, because the garter stitch used on the bar is still a bit visible. Overall, though, I’m pleased with the end result of the fulling. I used Patons Classic Merino Wool and a bit of Cascade 220, which are quite smooth, so the felted fabric was perfectly matted and not at all hairy. Most importantly, I was really happy with the whole thing. It looks really cool, is unusual, yet usable, and would be a good gift for my parents. They thought it was cool. The board measured about 36 inches long and 13.5 inches wide before going into the wash. Afterwards, the dimensions are about 24 inches long by 10.5 wide. 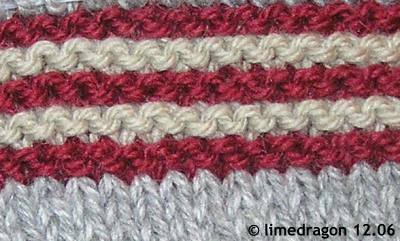 The pattern is from KnitWhits, and it is also available as a kit. I chose to get the pattern only so I could knit in a palette better suited for my parents. How cool! At first I thought, what a weird scarf… but with the final picture, “Ahhh…” Do you play backgammon? That is brilliant! Are you going to knit some markers as well or are you going to use buttons? I like Mrs. Pao terms – that IS brilliant! That is SO cool! It’s absolutely wonderful! wow. 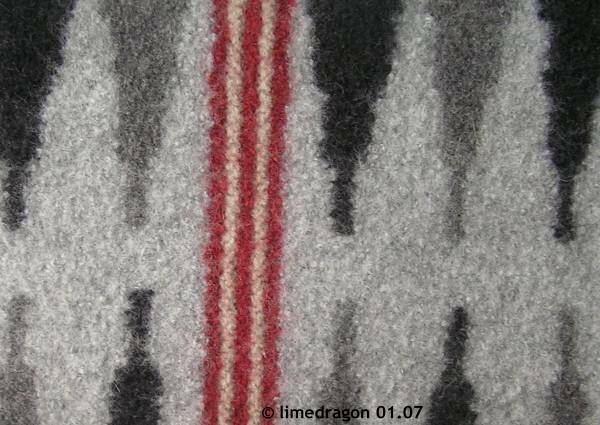 you knit a backgammon game! great. Bloody brilliant! It looks fabulous.